Daniel Smith Luminescent watercolours can be used alone or mixed into standard colours to create subtle effects of light and colour. 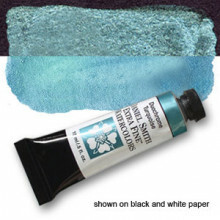 Duochrome colours, like Duochrome Turquoise, reflect light and provide a fascinating sense of depth, along with a distinctive sheen and colour that changes with the angles of reflection and observation. Click the button below to add the Duochrome Turquoise Series 1, 15ml Tube Daniel Smith Extra Fine Watercolour to your wish list.